My mother in law recently helped us out big time by grouting the floors in our new house. Method of payment requested: shrimp & grits. I had no problem with this! It all started during our honeymoon in New Orleans. I had shrimp & grits at least 2 out of the 4 days we were there. The best one was at the Palace Café. They make it with goat cheese! My shrimp & grits doesn’t even compare to theirs. The first time I ever made shrimp & grits was when my husband & I had our families over to watch our wedding video. We were still thinking about our honeymoon & had a little NOLA inspired gathering. That recipe was a little fattier fancier than this one. It had heavy cream & a ton of butter. Come to think of it, this recipe is just as fatty fancy. It calls for bacon fat & cheddar cheese! I adapted this recipe from one I saw online, & have made it a few times now. My mother in law loved it! Shrimp is becoming a staple in our freezer; & grits a staple in our pantry. 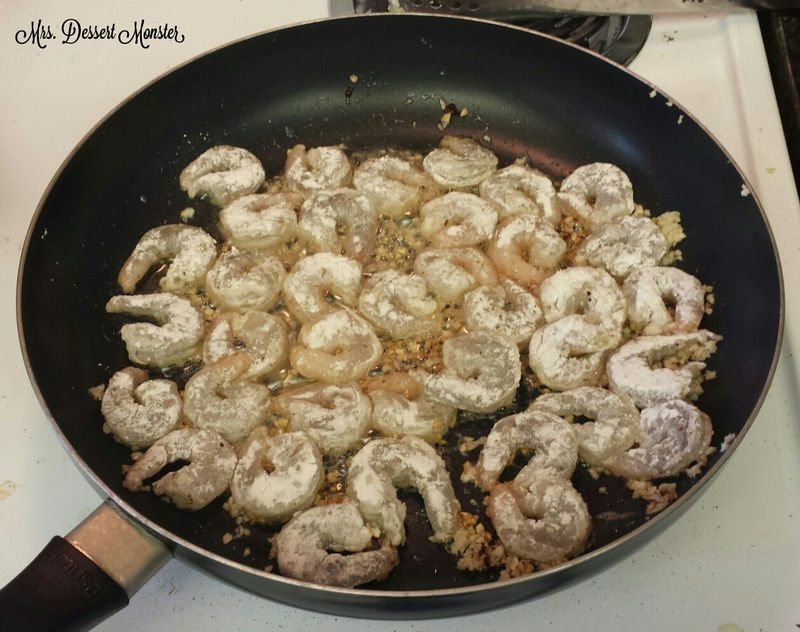 While my husband was making the bacon, I sprinkled some salt & pepper over the raw shrimp & dredged them in flour. I also minced up some garlic. Then I started making the cheese grits. It’s essentially the recipe from the Quaker Oats Quick Grits package, minus garlic powder & paprika since the shrimp has a lot of garlic & flavor already. Once hubby was done with the bacon, I threw the garlic into the pan with the bacon drippings (I poured a little out until I had about 2 tbsp. left). This alone made the whole house smell amazing. After a few minutes, I added the shrimp into the garlic pan. Once the shrimp was cooked, I added lime juice, hot sauce, & water. I made sure to stir it up good so all the bacon goodness left at the bottom of the pan was incorporated. I cooked it for just a few more minutes to let the liquid reduce a bit. Then, once the cheese grits are done the only thing left is to crumble the bacon & plate. I used a slotted spoon to scoop up the shrimp without too much of the liquid. You can drizzle as much or as little as you like on the grits! This is so good, y’all. It’s becoming one of my signature recipes. Cook bacon in a large skillet, reserving 2 tbsp drippings in skillet. Crumble bacon. Season shrimp with salt and pepper, then dredge in flour. Sauté garlic in bacon drippings for 2-3 minutes. 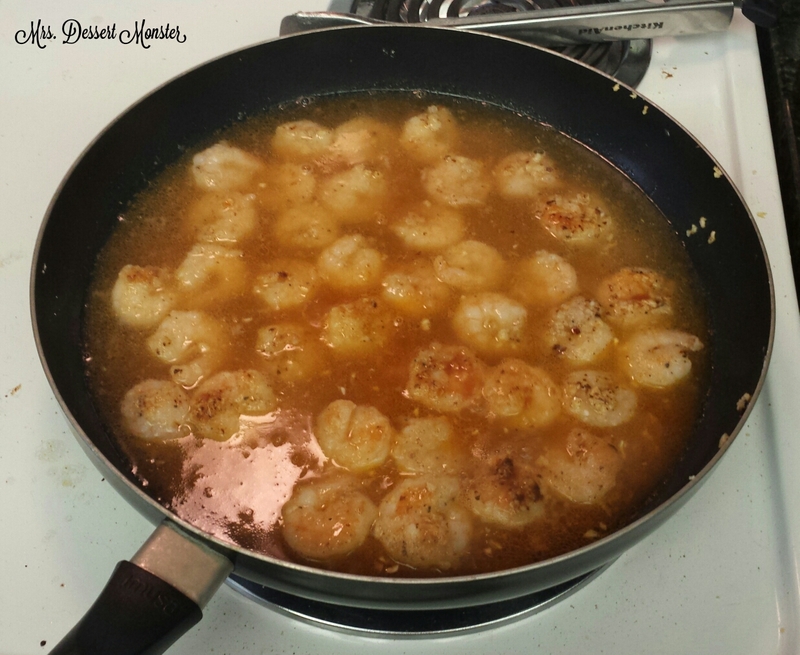 Add shrimp & sauté until they are cooked throughout. Add water, lime juice, & hot sauce, & cook for 2-3 minutes until liquid reduces a little, stirring to loosen bacon bits stuck to the bottom of the skillet. 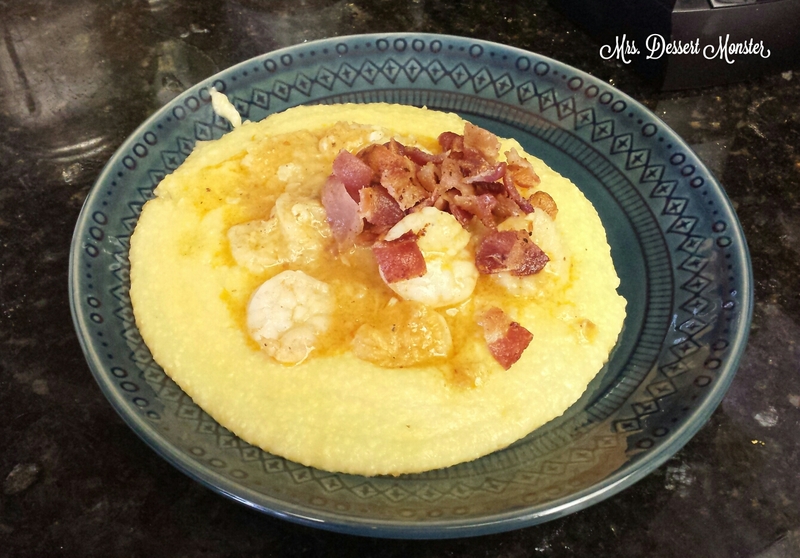 Spoon shrimp & liquid over cheese grits; sprinkle with crumbled bacon. Cover & reduce heat to medium-low. Cook 12-14 minutes or until thick, stirring occasionally. Add cheese. Cook 2-3 minutes, stirring occasionally until cheese is melted. I really need to make shrimp and grits sometime. 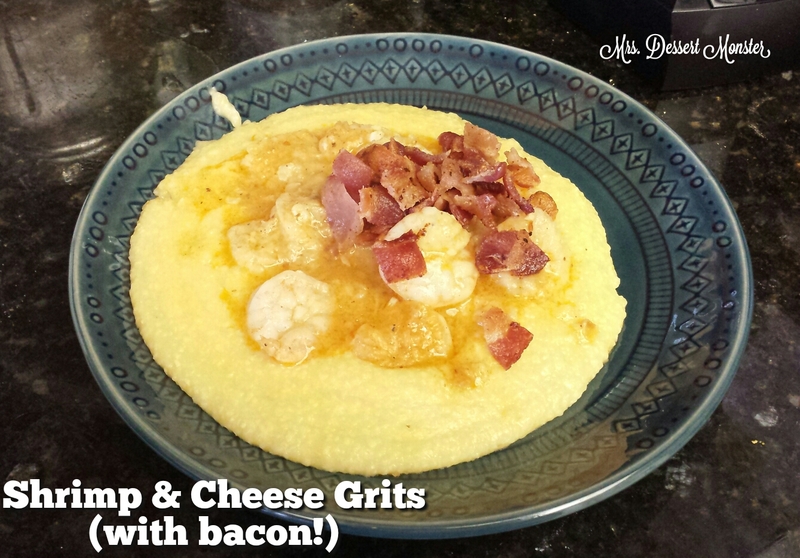 I have never made grits before, but have heard so much about this combination. I think cheese and bacon sound like great additions! It’s not hard! My husband suggests to stay away from instant grits – not as good & grits don’t take that long anyway!